NEW ORLEANS — History tells us that if a women’s team wins an NCAA Division I cross country title by 80 or more points, good things are in store the following season. So you better believe the New Mexico Lady Lobos’ ears perked up at that sentence. Last year New Mexico became the fifth team in history to completely dominate a championship meet (read: outscore the runner-up by the aforementioned margin). The Lady Lobos tallied 49 points to Colorado’s 129 and those 49 points were the fewest scored by a championship team since Virginia notched 48 in 1981. The previous four teams that won by 80 or more points — BYU, Colorado and Villanova (twice) — either captured a second title in a row (BYU and Villanova) or finished runner-up (Colorado). So New Mexico is in some pretty good company. If a team’s margin of victory was between 56 and 79 — as was the case for the national champions from 2012-14 (Oregon, Providence and Michigan State) — their ensuing season ended without holding hardware. Obviously some supernatural force wasn’t keeping the Ducks, Friars and Spartans from repeating as national champions, so what allowed the Buffaloes and Wildcats to be so successful the following year? More importantly: What does this all mean for the Lady Lobos? The Wildcats, guided by 2016 USTFCCCA Hall of Fame inductee “Uncle” Marty Stern, put together quite the dynasty in the late 1980s and early 1990s. From 1989 to 1994, Villanova won an unprecedented six national titles in a row. As you can see from the table above, two of those victories came by 80 or more points. Continuity spurred the Wildcats as they returned six athletes from its 1990 title team in 1991 (Sonia O’Sullivan, Carole Zajac, Nnenna Lynch, Cheri Goodard, Carol Haux and Michele Torelli) and two from its 1991 team in 1992 (Lynch and Zajac). O’Sullivan won back-to-back individual titles, Zajac finished close by and Lynch stepped up each year. The Cougars weren’t hit by a case of the Mondays on November 19, 2001. BYU put together an otherworldly effort on the campus of Furman University as all seven of its runners finished inside the top-50, led by Michaela Manova (fifth), Jessie Kindschi (seventh) and Tara Northcutt (ninth). Only Manova and Kindschi returned the following year and the Cougars won by 28 points, compared to 86 in 2001. Manova improved upon her finish (moved up to fourth), while Kindschi fell all the way back to 107th. What helped BYU in 2002 were the additions of Kassie Anderson (seventh) and Katie Martin (20th). The last time the Buffaloes won a national title came in 2004 and what a win it was. Colorado, led by Renee Metivier, Liza Pasciuto, Christine Bolf, Sara Slattery and Natalie Florence, steamrolled over the competition in Terre Haute, Indiana and won by 81 points over runner-up Duke. Metivier, Pascuito and Bolf all finished inside the top-15. The following year, Bolf and Pisciuto returned to form a powerful 1-2 punch (7-9 finish at NCAAs) and a young freshman named Jenny Barringer crossed the finish line in 43rd place as the third finisher for the Buffaloes. Stanford’s top-3 proved to be too much for Colorado, however as the Cardinal went 8-20-25 and gave it just enough space to hold off the hard-charging Buffaloes. The Ducks couldn’t be stopped with Jordan Hasay and Alexi Pappas at the top of their scoring lineup in 2012. When you throw in Katie Conlon and Alice Woodward as the supporting cast, there was little hope for the competition in Louisville, Kentucky. 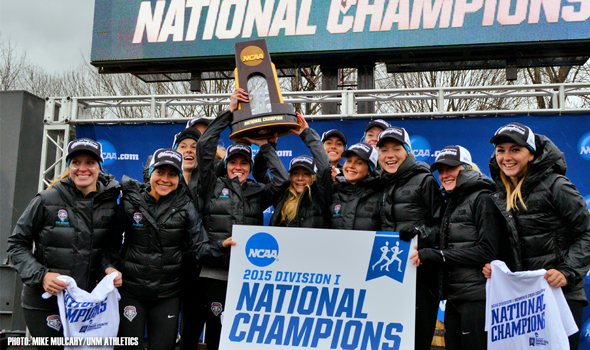 None of those four women raced at NCAAs in 2013 and Oregon found it hard to replace them. Annie Leblanc, the Ducks’ fifth runner in 2012, became their No. 1 runner in 2013 and finished 66th at NCAAs when the race returned to The Hoosier State. The Friars didn’t have much room for error in 2013 as they only brought six runners with them to NCAAs. One or two bad performances and they’d be in dire straits. Well, Providence’s sextet rose to the occasion and cruised to a 56-point win at the LaVern Gibson Championship Cross Country Course. The Friars overcame attrition thanks to the efforts of Emily Sisson (7th), Laura Nagel (27th) and Sarah Collins (39th), among others. Collins, Nagel and Sisson weren’t in attendance the following year and a sophomore by the name of Catarina Rocha led the way for Providence in 33rd place. The Friars only had two other runners finish in the top-100 and limped to a 13th-place team finish. Two years ago the Spartans put four runners inside the top-25 and romped to a 62-point win. Last year Michigan State tumbled 12 places to 13th despite lofty prognostications. Well, the Spartans’ scoring lineup from 2014 wasn’t intact the following year and one runner who should have been a main cog (Rachele Schulist) battled injuries all season. That left Michigan State in a lurch and while Alexis Weirsma fought her way to 21st in 2015, she had little help around her to make a dent in the team standings. We’ve used enough Internet bandwidth discussing the Lady Lobos’ 2015 season. It’s time to look ahead to 2016 to see if Joe Franklin’s team can join the ranks of BYU and Villanova as repeat champs following a huge victory at NCAAs. The closest comparison we can draw between those aforementioned teams and the Lady Lobos is that of the Cougars. Like BYU, New Mexico returns runners who placed really well the previous year — Alice Wright (fifth), Rhona Auckland (13th) and Calli Thackery (15th), compared to Michaela Manova (fifth in 2001) and Jessie Kindschi (seventh). And just like the Cougars, the Lady Lobos welcome several talented runners to its roster for the 2016 season, which sees them as the preseason favorite — Elizabeth Weiler and Kathryn Fluehr. Weiler finished 38th at NCAAs in 2014, while Fluehr was 81st for Princeton last year. On paper, it’s hard not to like New Mexico’s chances — but races aren’t run on paper. That’s what the grass is for. We’ll see what happens November 19 when the NCAA Division I Cross Country Championships return to Terre Haute, Indiana.